← List three fantasy worlds you’d like to visit, and why you’d want to go there. What do you consider your greatest accomplishment in the area of fantasy fiction writing in 2010? This lovely cover was done for FantasyFic by Swedish artist Karolina Sefyrin. 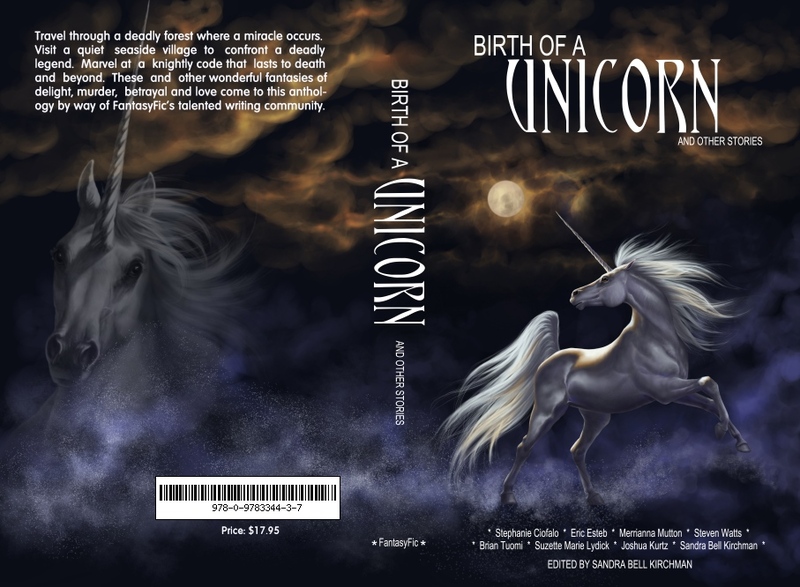 There comes a time in each editor’s life when she says to herself, “This is it!” Birth of a Unicorn and Other Stories was like that. The ingredients were contributed by seven of the top writers who frequent the forum attached to my website, plus me. Originally the site was to promote my own writing, but writers started coming to the forum…talented writers, with a lot of humor, good ideas, and a love for fantasy. And so the idea for this anthology was born. This is a first-time publication for nearly all the writers, not because they lack talent but because they didn’t have sufficient confidence in their writing. After schmoozing for months at FantasyFic, and with an invitation from me after I saw the literary excellence of their stories, they took the plunge, submitted and were accepted. Each writer is quite different from the other. Stephanie is a geologist who works with government data, Eric is a Colorado filmmaker, Steven is a southern gentleman and an IT whiz, Brian owns a small consulting company in Canada, Merrianna is a sweet young woman who plans a career as a writer, Suzette is a busy California mother of two, and Joshua is a bright young student with a flair for comedy. Two things that draw them all together are a love of writing and a passion for fantasy fiction. DragonSnail has graced our forum as well. Known in the real world as Karolina Sefyrin, of Sweden, this very talented artist designed the book cover for our anthology. One look at it blew us all away with its lovely vision so beautifully fitting the images generated in the first story of the anthology. It also gracefully portrays the general fantasy-theme of the rest of the stories. Sincere thanks go out to all the writers for their enthusiasm and dedication. I am especially grateful to Stephanie Ciofalo in Arizona for her help in editing, proofreading and research, and to Suzy Lydick in California for her research and for preparing the wonderful spreadsheet that helped keep me organized. I hope you enjoy this book as much as we have enjoyed getting it ready for you. It has indeed been a work of love. P.S. Official worldwide release of the anthology was on October 2, 2010…and it was finished. If you would like to visit these fine young writers, you can find them lurking, along with other fine young writers, at my website forum at FantasyFic.com. This entry was posted in fantasy fiction, General and tagged accomplishment, achievement, Anthology, Arizona, California, Canada, Colorado, Fantasy, fantasy fiction writing, postaday2011, writing achievement. Bookmark the permalink. In the blog in Spanish i write about economics, while in English I write to improve my knoledge about this wonderfol idiom. Oooh, I like your English blog. And that MorgueFile is a great find. I am very excited. I have added your My Hat Goes Off blog to my blogroll. What exactly does “mesacoelsombrero” mean? “Me saco el sombrero ante el blog de Sandra” has the same means of “My hat goes off to the Sandra´s blog”. And again, thank you for your comments and for the description of my blog!!!!! I will read all your posts are very intersting :). I was looking for some fiction in English to read, and now I think that i have found it!!! Good website! I actually love how it is easy on my eyes as well as the details are well composed. I am wondering how I might be notified whenever a new post has been made. I have subscribed to your rss feed which really should do the trick! Have a good day! Thanks for your kind words. I’m glad my site is easy on the eyes. I hadn’t considered that. As for being notified, if you subscribed to the site itself, you should automatically get an email advising of a new post. Also, when you leave a reply, there is a box underneath “Post Comment” to check for notification of new posts via email. Looking forward to more of your comments. It seems we think alike, let me know if you want to talk some more on the topic. I only wish i could write like you do.